An authorised officer (Health Department inspector) is the only person to have write access to this form. Everybody has the ability to view this form. It is accessed from the Main Menu > Authorised Officer. The form is used to make comments on any audit performed on the EasyDose transactions. 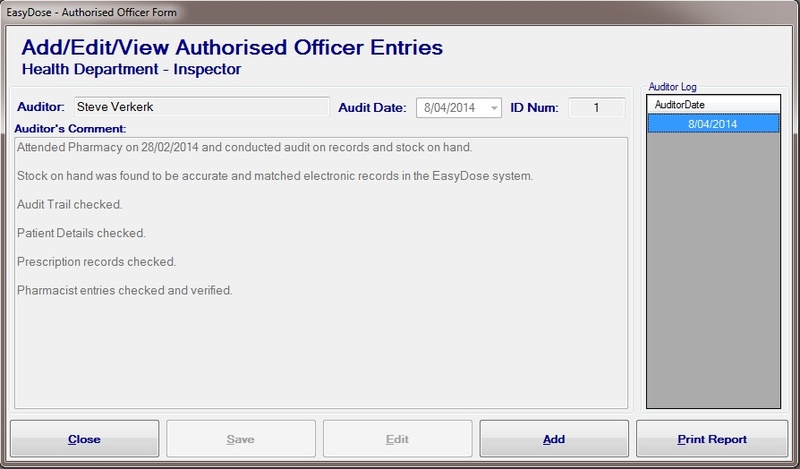 When an authorised officer is logged on, their name automatically populates into the Auditor field. The Date field is populated with the current date. Clicking ‘Add‘ will unlock the form and enable the ‘Save‘ button. The Comments field is free text where any comments are stored by the authorised officer. When saved, the officer’s report can be printed. Anybody can print an entry. Nobody except the person who made the entry can ‘Edit‘ the entry. As the number of entries increases, the list on the right grows, showing the date list of the entries.